Two weeks on from their home humbling at the hands of Slough, Leamington dished out a Southern League thrashing of their own to hapless Dorchester, writes Paul Okey. The hosts dominated the game from the outset, with the visitors regularly coughing up possession inside their own half in the face of impressive pressing from Brakes. Ahmed Obeng opened the scoring inside the 12th minute and such was Leamington’s control that Tony Breeden did not have a save to make until the 88th minute. Indeed, the only disappointment on a bitterly cold afternoon was the failure of Paul Holleran’s side to wipe out that six-goal reverse in one fell swoop, with a host of promising opportunities going begging. Darren Pond had already had an ambitious pot-shot before Obeng broke the deadlock, slotting home after Jack Edwards had headed on Breeden’s free-kick. Breeden was in the wars at the other end after rushing out to clear a through ball ahead of Lewis Powell, getting a painful blow to the groin in the process. Ahmed Obeng slides home Brakes' opener. It was a rare moment of involvement for the Leamington skipper, however, with Dorchester’s willingness to play out from the back presenting the home side with numerous opportunities to steal possession. A Connor Gudger cross from the left had Shane Murphy backpedalling before landing on the top of the net, while the same flank provided another crossing opportunity from which Edwards headed the delivery wide. Loan signing Callum Powell was benefiting from a much-improved surface from the one he had encountered on debut at King’s Lynn and his willingness to run with the ball earned him a free-kick 25 yards out. The winger took it himself and beat the wall only for Murphy to paw his shot to safety. Powell was not to be denied, though, and opened his Leamington account in the 23rd minute. Dorchester were caught in possession by Edwards who quickly released Obeng. He in turn laid the ball off for Powell who benefited from a lucky ricochet off Matt Oldring and then made no mistake from close range. Obeng almost pounced on a mistake from Murphy to make it three after he was unable to hold on to Courtney Baker-Richardson’s shot but the keeper eventually claimed possession after an ugly tangle of arms and legs. Baker-Richardson drilled another opportunity wide, while Obeng underlined the home side’s growing confidence with a flashy stepover and venomous shot which rattled the angle. Obeng then wriggled his way through two challenges before laying the ball off to Edwards who drew a superb save from Murphy. Baker-Richardson got the follow-up all wrong, ballooning the loose ball over the bar. Leamington remained on the front foot after the restart, with Baker-Richardson’s fizzing cross from the right deserving of a finish and Jordan Goddard drawing a parry from Murphy. Four Brakes players were left unmarked on the edge of the Town box from a Richard Taundry free-kick, with Obeng taking possession and driving in a shot which the overworked Murphy kept out with his feet. Despite Brakes being in total control they nearly handed the visitors a lifeline when James Mace’s backpass was intercepted by Ollie Mehew. However, Breeden quickly closed down the attacker and when the ball was cut back into the danger area there was no attacking player to take advantage of the empty net. Ollie Bassett then almost caught Breeden out, taking a difficult ball in his stride and looping in a shot which only just drifted past the angle. Brakes responded almost immediately, with Mace’s defence-splitting pass releasing Baker-Richardson who looked a model of calm before drilling the ball into the far corner past an exposed Murphy. It was 4-0 on the hour, with Mace timing his run to perfection to glance Goddard’s corner into the net. 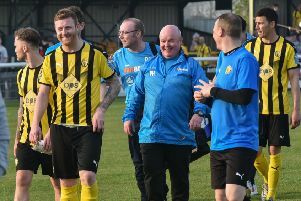 Bassett worked space for a shot which failed to trouble Breeden, while a Powell effort was comfortably claimed by Murphy at the other end before Leamington added their fifth courtesy of Rob Thompson-Brown. The substitute had only been on the field seven minutes but showed unerring accuracy to beat Murphy from 20 yards after latching on to a half-clearance. The brittle visitors continued to show a willingness to get the ball down and play and Brakes carried on fashioning chances, with Jamie Hood’s near-post header from a corner and a neat piece of skill and cross from Richard Gregory both crying out for someone to add a close-range finish. However, it was the visitors who created the final opportunities of the game. A Gudger clearance was blocked by Ben Wood who raced through on goal but Breeden was in no mood to relinquish his clean sheet, blocking with his legs. Obeng then showed a full 90 minutes had not robbed him of any of the off his pace, racing almost 80 yards to put in a superb block after the hosts had been caught on the counter.